Soaring Eagle Award "Chain Gang"
Skip Fox – 1965 graduate of Schoolcraft High School. He served on the School Board for 30 plus years, has two sons who graduated from Schoolcraft High School and are now employed at Schoolcraft Community Schools. Skip also has several grandchildren actively involved at Schoolcraft High School. Jeff Bell - 1966 graduate of Schoolcraft High School and lifelong resident. He has one son who graduated from Schoolcraft High School. Jeff has 25+ years teaching in the district, is a local business owner, and 25+ years on the chain gang. David Krum – 1965 graduate of Schoolcraft High School. He served on the School Board for 30 plus years and is a lifelong resident of Schoolcraft. David has three children who graduated from Schoolcraft and now grandchildren in the school system. He is the previous owner of Krum-Hallam Chevrolet. He serves on the board of Kalamazoo State Bank and also the Schoolcraft Foundation. Richard Goldschmeding – Richard joined the chain gang about 12 years ago. He has two sons who graduated from Schoolcraft and currently three grandchildren attending Schoolcraft Schools. Richard served as Little League President and coach, Rocket Football President and coach, Booster Club President, volunteer assistant on the football sideline and assistant baseball coach. 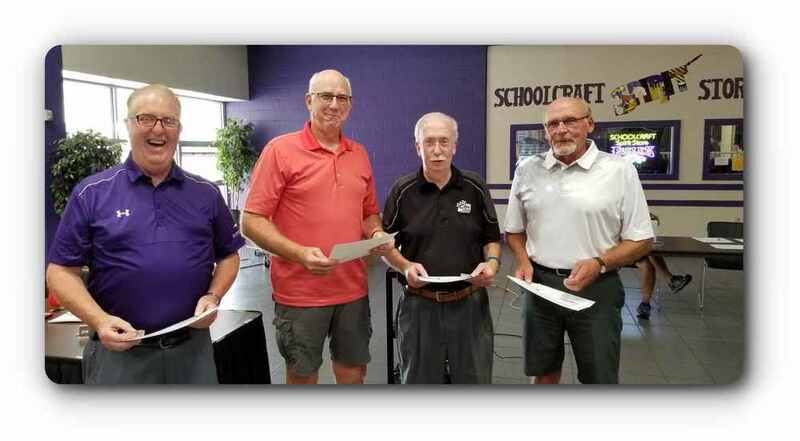 Richard has also served on the Facility Planning Committee. .
All of these gentlemen exemplify compassion, respect, and integrity for our school and community.